Homeowners associations (HOAs) define a neighborhood’s aesthetic rules. Many have tried to restrict the ability of homeowners to go solar. Fortunately, West Virginia law prevents HOAs from doing so. West Virginia Code §36-4-19 prohibits any housing association from restricting the installation or use of solar systems. Any document executed before the addition of this code which prohibits or limits the installation or use of solar systems is unenforceable. HOAs may, however, vote to establish rules prohibiting or restricting the installation or use of solar energy systems. Having trouble with your HOA? 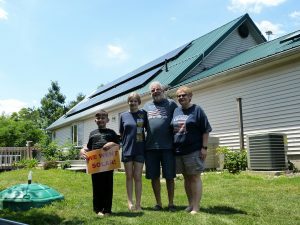 Post to the Solar United Neighbors of West Virginia Listerv and get advice from fellow solar owners in your state. You can also contact our team at WVteam@solarunitedneighbors.org if you have specific questions on the issue.